When it comes to source citations I'm coming to believe that done is better than perfect. Slap-dash, haphazard, careless, half-hearted, inaccurate source citations aren't acceptable, at least to me, but a best try that will lead me or anyone else back to the original source and document the live of ancestors is better than perfect sources never cited or recorded. For too many years I've hesitated to add sources (and the ancestors they support) to my genealogy program because I didn't want the citations to be wrong. (This is an imperfect perfectionist typing here.) I worried about format and style and correctness so much that having a citation that led to the original source of the document went by the wayside. That resulted in no record of the document and no citation in my genealogy program. The documents and sources stop at the paper on which they're printed or an image saved to my computer. I've always carefully recorded the source's information: the url, the website name, the collection information (title, volume, page, line, etc. ), and any other notes that clarify the source and information about the document. Sometimes I go so far as to write a blog post about the search and the results. And then I add the paper to a stack or a surname file. And you know what happens to all those papers, right? Stacks. Notice the photo above. 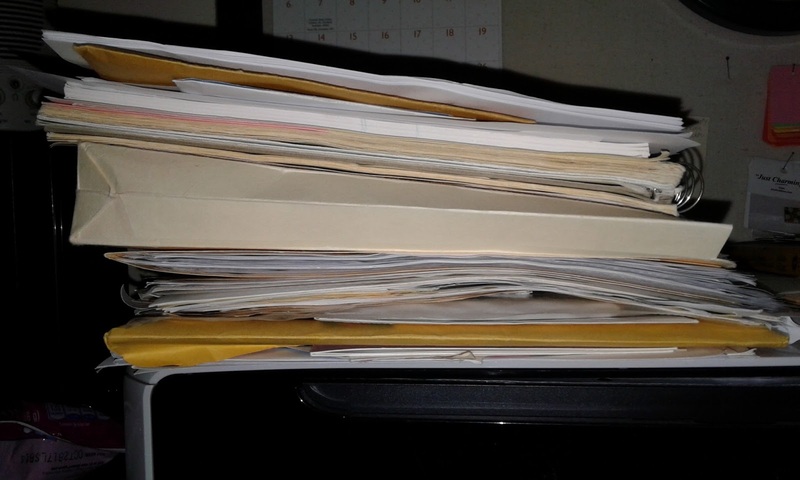 Those are 8" of papers in an open file box awaiting action. And the stack at right is about 5" high and sits precariously on top of my scanner. Do you know how many papers it takes to reach 13"? I don't want to count. The fact is, those papers stacked near my computer are nudging me out of my work space. My non-citing of sources has to stop. 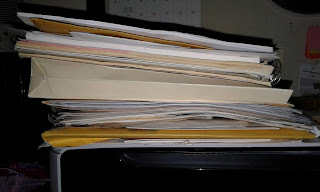 About two months ago Colleen Brown Pasquale wrote a post, Mastering Genealogical Proof & Mastering Genealogical Documentation, on her blog, Leaves & Branches. In the post she reviewed Thomas W. Jones's books by the same name and described how helpful the second book been to her in overcoming "citation anxiety." From a conference talk by Dr. Jones she shared his belief that "content is more important than form." Done is better than perfect, right? A best effort is better than no effort at all. Thank you for the motivation, Colleen and Dr. Jones. Yesterday I pulled out half a dozen obituaries (dating from 2013 to this year) and a copy of a 1901 news article about my g-grandfather that I've had for months, opened RootsMagic, chose a fact to add to each individual's page, chose the closest source type, and added the information. Perfect? No. Several of the obituaries I found online and I didn't find an exact source type in the RootsMagic list. But I found one that worked and all the information I had about each item was included. Anyone who wants to find that document will be able to. It might take me many months (or years?) of consistent entering of documents/citations to my genealogy program to move the papers from stacks to their appropriate places but what a relief it will be to have the information all in one place and organized for each person/family in my genealogy program. What a relief to see what information I have for each ancestor. I can do this! 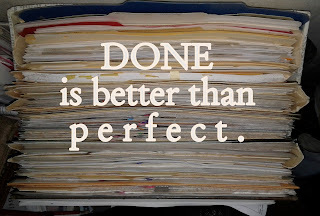 Done -- and done as well as possible -- is better than perfect. Thank you again to Colleen and Dr. Jones. Do you have or have you ever had "citation anxiety?" I get irritated with my genealogy software when I try to enter citations. There is no way to override the supposedly helpful formatting for entering the information. I wish to include any info that would help someone locate the same piece of information, no matter which website they look for it on (Ancestry.com vs FamilySearch, for instance). So I get tired of fighting with my software and just let my stack pile up as well. I don't know which program you use but maybe there's an option for a "make your own" or general citation that you could adapt for the information you have. Sometimes I've gone so far as to put the information in the notes section for the individual. That's interesting to know about Legacy. RootsMagic has an option to create your own format but I don't think we can override a citation. Nancy, you've expressed exactly how I feel about source citations. 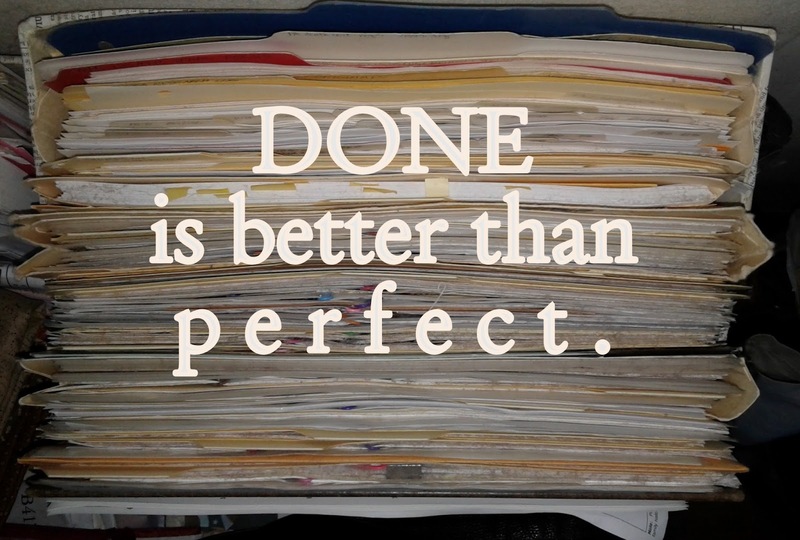 Done is better than perfect any time. As long as someone else can understand the source (and duplicate my research if necessary), that's sufficient. Thank you for this articulate post. And since I now use RootsMagic, I'm going to follow your example on the sources. Thanks, Marian. I've been adding sources today and find that sometimes the options in RootsMagic don't match the kind of source I have. Lots of creative thinking about how to add them. Good luck with your efforts! For sure - I get so anxious about it. Everywhere I go, I hear about how we must all use the perfect system invented by Elizabeth Shown Mills as outlined in her mammoth tone, Evidence Explained. I borrowed it via interlibrary loan and was completely overwhelmed. And I have two degrees in history and am a librarian (with a diploma in Library and Information Technology)...so if EE confuses and baffles me, I can't imagine how it is for the lay person who normally doesn't have to write up citations. I recently have started working on simpler citations and/or, just adapting what I pull off of Ancestry and FamilySearch. No, their citations aren't "perfect", but they do the trick. It's nice to know there are more of us out there who feel that we do have a choice in how we cite our sources, that we don't have to agonize about whether we have it just right. In cataloguing, we have a saying about creating and amending records - most of us are under time constraints so we need to strive for "good enough" rather than "perfect"...I've now realized I an apply this same standard to my citations. That's been me, too, Teresa -- anxious and for too many years. I've borrowed EE, too, and poured through it trying to find exactly the kind of citation I have, sometimes without success, and then not be able to match it to anything in RootsMagic. I'm going to buy Dr. Jones's book and hope it helps. Imperfect citations are better than none, especially if they lead us and readers back to the original source. Thanks for visiting and leaving a comment. I appreciate it. Thanks, Alona. You will, you will! I guess it takes determination to do it, doesn't it? I added a few sources last week and three more today. Out of hundreds.... But it's great to have them done. You're so right. Before I knew the "proper" say to source citations, I always wrote out all the information that I thought was necessary. Once I learned about proper formatting, I became more hesitant to cite the sources because I was sure I was doing it incorrectly. Even though I know done is definitely better than imperfect, if I don't have the time to do it correctly, many times I don't, and I should. Hi, Shasta. I think Elizabeth Shown Mills's tome, Evidence Explained, was the tipping point in citations intimidating me. For a while i just used the notes section and added all the information there, but that didn't work very well. And you sound like you have a tendency toward perfectionism, too, like I do. I'm trying to push myself to accept the best I can do. It's discouraging to know I have all this information, open my RootsMagic program, look at an individual, and find none of it there. I guess we all do the best we can. I'm obsessive about citations haha. It definitely slows me down, I might start trying this soon thanks for the great post!. Hi, Renee. I have been so obsessive about citations that I just haven't done them. Even with the way I'm doing them now, I'm not fast about it. But I know I'll be happier to have all the information together, all documented. Thanks for sharing in the conversation. Yes, 'done' is more important than 'perfect'. I started researching my family history in the 1970s, and (long before I read about a 'right way' to do citations) I developed my own simple but effective system for recording the source of each piece of information. Over time I've refined my system, but I don't get all bent out of shape because my citations are not formatted exactly as shown in 'Evidence Explained'. Good to know, Judy. I suppose if we're doing our research for ourselves and don't expect to publish it that our own system is just fine. I don't anticipate publishing my research so I should be good but I know if I ever do publish, I'll have enough information to do an EE-proper citation. I agree, Nancy. My source citations contain enough information to be converted to formal 'Evidence Explained' format if necessary. I (self)published a family history book back in the 1980s, and even then my source references were adequate. I'd learned a bit about citing sources at Uni (Bachelor of Applied Science). I use the 4W approach - Who, What, Where, When. Who wrote or published it, What is it called, Where was it published or found, When - the date. The order doesn't matter provided you ask these questions, tho occasionally there will be no answer to one of them. Not long ago I read of someone else using the 4W approach, too, Danielle. We thinking of the Ws of newspaper reporting but this gives it a different slant because the citation doesn't use the who to name the person in the record. I'll give this some more thought and maybe put it to use.